I just returned from an amazing ten day vacation to France with my wife and young son. We spent three days in Paris before heading south to Avignon and then to Cannes for the last half of our trip. I’ll be posting a detailed overview of some of the amazing meals we had there, but first I wanted to cover what was perhaps my favorite day of the trip. We booked a private driver to take us from the lovely Hotel D’Europe in Avignon through Chateauneuf du Pape and into Gigondas as we visited four estates, a wine tasting cave (!!!) and enjoyed a great Provencal lunch. The first thing I noticed as we made our way through the vineyards was the vast difference in terrain compared to what we are used to seeing out in California. Let’s get the obvious out of the way first: the soils are made almost completely of pebbles of rock as opposed to purely dirt. One of the reasons that wine is so fascinating is that it expresses so many disciplines of science all into one medium, and in this case the geological aspect of winemaking was striking from a visual standpoint. 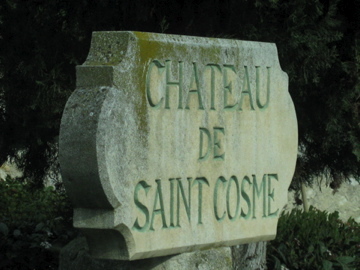 It was immediately easy to understand why these Rhone wines exhibit such unique, inimitable flavors when compared with the versions attempted in the United States. (That’s not to say that they are better or worse, just that the difference in flavors becomes obvious once you actually see vines resting in piles of rock). Also, the vines themselves, being incredibly old compared to those in America, are trimmed short to keep yields low and maximize quality. 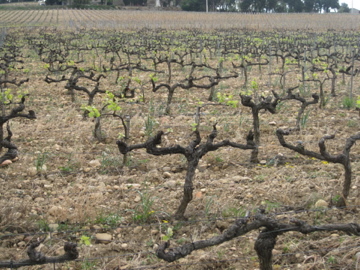 Although it was April and the vines had not yet begun to fully bloom, we could easily see how many less grapes were expected to grow on each tiny, trimmed vine. This is a famous estate that doesn’t normally offer tastings to the public, but I had received written email correspondence arranging an appointment. Upon arrival, we were met with confusion from one of the winemakers, who didn’t speak a word of English and apparently had misunderstood our appointment date. 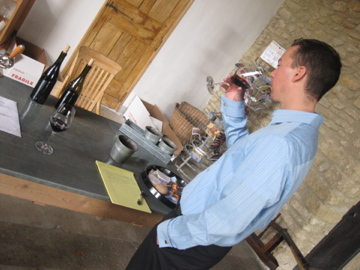 Nevertheless, he was friendly and poured us three wines from different labels. We tasted the Domaine des Pallieres Terrasse du Diable 2008 (88 Points) as well as the elegant La Roquete Chateauneuf-du-Pape 2009 (92 Points), which is light on the palate with its jammy yet elegant red and blue fruit notes laced with white pepper spice and mushroom earth.The estate Vieux Telegraphe Chateauneuf-du-Pape La Crau 2009 (93 Points) was the standout, showing a solid core of elegant cherry, licorice and red plum fruit along with a streak of medicinal mineral and a long, nutty finish. I bought a bottle of the La Roquete for a reasonable €27 ($52 in US). 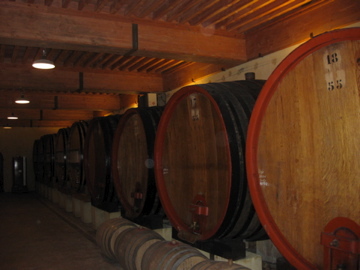 The highlight of the tour overall was our walk through the barrel-room, where we learned about French winemaking technique. Vieux Telegraphe ages their red wines for a year in steel barrels before putting them into incredibly large oak barrels (7,000 gallons compared to the 60 gallons typical of an American barrel) until they become ready for bottling. 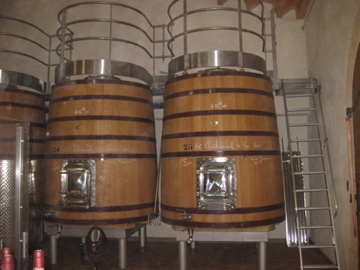 The use of steel early in the fermentation process combined with using much larger oak barrels than we see in America accounts for the lessened influence of the oak upon the character of the wine itself. This was the stop that I was most looking forward to and it certainly lived up to the hype. I had to laugh as the friendly woman pouring for us began our visit by asking, “Which wines are you interested in tasting?” I had to stop myself from replying in disbelief “Umm, everything!” and was somehow able to reply instead that I wanted to focus on reds and especially wanted to try the highly acclaimed 2009 vintage. Her response was that if I wanted to try the 2009, then I should most certainly try the recently bottled 2010 first. She then insisted we try the 2004 to taste and compare the complexities that the wine has acquired with age. Don’t mind if I do! CLOS DES PAPES CHATEAUNEUF-DU-PAPE 2010, 97 Points, $125– Elegant, inviting nose of dark raspberry and blackberry perfume. Deep, elegant mouthfeel of dark plum, blackberry, and chocolate with mineral spice underneath. Very rich and powerful with its dark currant and cocoa notes, yet amazingly balanced and creamy for its youth. Exotic spices linger long as the finish goes on for a solid minute. Texture is amazing, with firm tannins adding grip. A huge effort that could end up the best of this bunch with the benefit of some cellar time. 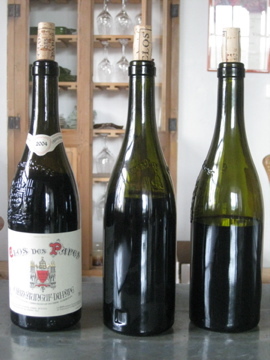 CLOS DES PAPES CHATEAUNEUF-DU-PAPE 2009, 97 Points, $125– Aromas of crushed rock, black cherry and red licorice are in huge contrast with the 2010. Silky as can be on the palate, with refined cherry, plum, red licorice and fig notes that are backed by layers of limestone, toffee and sweet spice, with a long finsh that boasts soft, velvety tannins. This has a light floral quality throughout and finishes on a light chalky note. 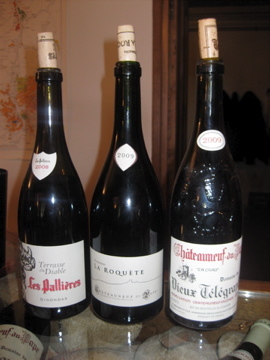 CLOS DES PAPES CHATEAUNEUF-DU-PAPE 2004, 98 Points, $125- Intriguing aromas of leather, ink, blueberry and mushroom. Amazingly juicy and perfumey on the palate, with explosive blueberry and dark plum fruit notes wrapped in floral violet above creamy but understated cocoa and earthy leather notes. Lavender spice lingers long and the tannins have almost completely dissipated, all in phenomenal balance with the long fruit notes. The slightest hint of chalky graphite mineral lingers with the cocoa and spices. Nearly perfect, the greatest wine I have ever tasted. 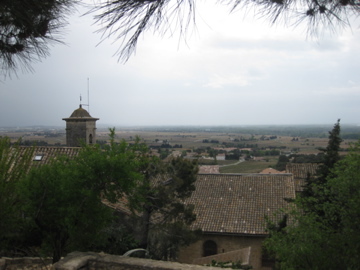 At the top of the lovely town that is Chateauneuf du Pape lies the ancient Chateau of the Popes that bears its name. We opted to dine at the nearby Verger des Papes, which offers spectacular scenic views of the region from its outdoor terrace. 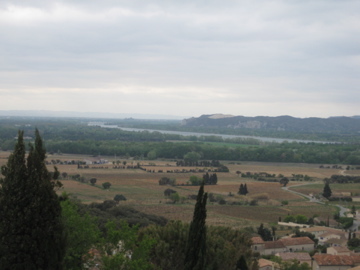 The Rhone River itself is truly a sight to see from this elevated vantage point as it winds and angles sharply through the vineyards and countryside (below). Unfortunately the weather during our visit was a bit chilly and windy at the town’s highest point, but the restaurant has many tables near the window that can enjoy the same view (below), one of which we were fortunate enough to snag. At lunch, the €19 Menu Formule offers three large courses at a bargain price. We enjoyed a salad of fresh vegetables and whitefish before a large boneless pork loin and finished with dessert. I drank Chateau Beaurenard Chateauneuf-du-Pape 2009 (89 Points) for €5 a glass, which shows a deep, smooth body of dark plum and chocolate that is creamy and balanced if a bit one-dimensional. After lunch, we ventured down the stairs to the Cave des Papes, an ancient wine cave used thousands of years ago to make wine that fermented naturally in deep, carved-out vats (below). 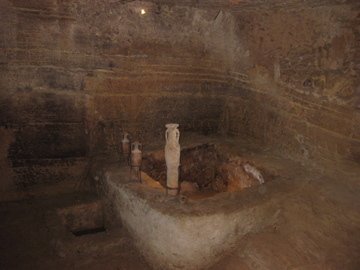 In addition to being a pretty amazing and historical discovery, the Cave is set up as a wine shop and tasting room. A very pleasant gentlemen poured us four tastes of wine here for no fee, my favorite of which was the Clos des Brusquieries Chateauneuf-du-Pape 2005 (90 Points). The wine shows perfumey wild berry fruit aromas above red fruit, licorice and minty mineral flavors, with black tea, wet limestone and a spicy cigar box note lingering. After lunch we made our way to this pleasant, family owned winery and enjoyed three tastes of wine from three different appelations. The daughter of the proprietor spoke perfect English and was able to lead us through the tastings while adding some interesting explanations of the soil differences. Our walk through the barrel room seemed to collaborate what we had learned at Vieux Telegraphe, and it began to make a lot of sense that using these enormous barrels to age the wine limits the influence of the oak and elevates the terroir of the wines, as verified by our tasting experience. The Vacqueryas 2009 (91 Points) is rich and full-bodied with dark currant flavors of plum and blueberry combining with tar, iron minerality and black pepper spice, while the Chateauneuf-du-Pape 2009 (92 Points) demonstrates a silky texture with a streak of cracked pepper running through elegant, well-structured black cherry and dark raspberry fruit. The highlight was the Cuvee Mourre des Perdix 2009 (93 Points), which showcases a violet perfume nuance that is embraced by blackberry and black cherry fruit, backed by chocolate and exotic spices over a rich, chewy texture. The Vacqueryas, priced at a mere €14.50, was too good a bargain to pass up, so I took a bottle with me. Back in town, we popped a bottle in our lovely room overlooking the terrace at the wonderful Hotel D’Europe, which is the clear choice among the hotels in Avignon. We received amazing service and a complimentary upgrade to a gorgeous room. 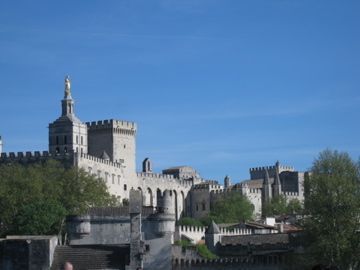 The day before our tour, we enjoyed the historical sights of the Palais des Papes and the famous Pont de Avignon bridge. Near the Palace, there is a small wine shop that sells Rhone wines at a significant discount to normal retail price, so we stopped in to pick up a bottle. The shop advertises itself as a tasting room as well, but this was not the case, as no one was incredibly eager (or friendly enough) to pour us any wine. 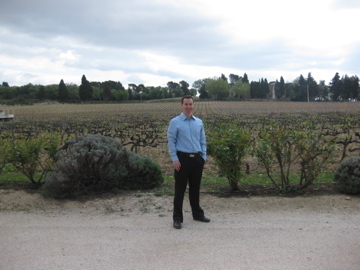 I had my heart set on a buying bottle of the Chateau Gigognan Chateauneuf-du-Pape Vigne du Regent 2006 (92 Points), as I had awarded the 2007 version with a “Wine of the Month” recognition last year. Although the 2006 doesn’t quite live up to the gamey complexities I remembered in the 2007 (93 Points), it is still a solid wine and developing nicely, with a smooth, concentrated body of juicy red plum, red licorice and red cherry fruit backed with pepper, sweet tobacco and a persistent mineral kick through the long finish.